FINAL SALE. 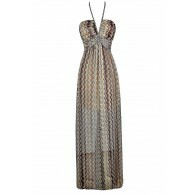 This glamorous and ethereal maxi dress is simple but manages to make a big impact. The Greta Chiffon Dual Strap Maxi Dress is fully lined to the mid-thigh. It is made of a semi-sheer chiffon fabric. It features gathered fabric at the bust and dual spaghetti straps on each side that crisscross in the back, forming and X. The empire waist gives way to the flowy maxi skirt. Fabric ruching at the back completes this dress. The Great Chiffon Dual Strap Maxi Dress can be as dressy or as casual as you like. Dress it up with strappy heels and a clutch or wear it as a more casual boho glam dress with beaded sandals and a bohemian headband. This is an ethereal look we love. Details: Fully lined to mid-thigh. 60% silk, 40% polyester. Lining: 100% polyester. Hand wash cold water separately. Color will bleed. No bleach. Hang to dry. Small measurements: Length from top of shoulder strap to hemline: 57". Bust: 33". You have added Greta Chiffon Dual Strap Maxi Dress in Orange into Wishlist. You have added Greta Chiffon Dual Strap Maxi Dress in Orange for Stock Notification. 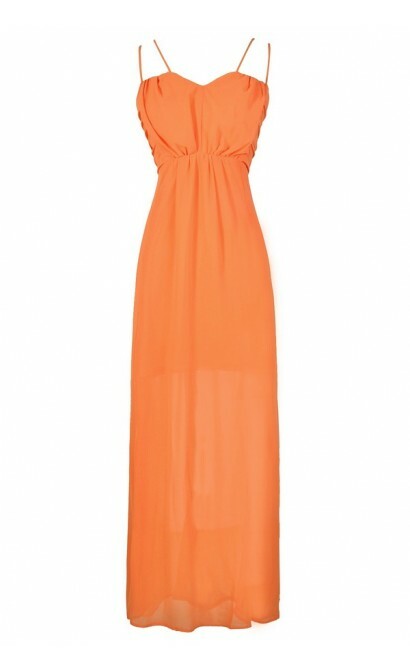 You have set Greta Chiffon Dual Strap Maxi Dress in Orange as a loved product. You have removed Greta Chiffon Dual Strap Maxi Dress in Orange as a loved product.